BEFORE–A Showroom way overdue for stripping and waxing. Your carpeting and floors say a lot about the way you run your business. The cleaner they look, the more appealing your place of business is likely to be. A clean, well-maintained office or storefront can entice clients and encourage productivity and job satisfaction in your employees. Conversely, dirty, dingy floors and carpets have a negative, off-putting impact on employees and customers alike. We want to help you make the best impression the first time and all the time by providing the most thorough deep cleaning of your carpets and floors you have ever experienced. Our team of professionals goes the extra mile to get them looking their best. We offer comprehensive commercial services for all floors to businesses of all sizes. You Are Contacting The Right Team! We at Sparkle Surface Care (by Classic Services) have built our service company as we know it today from the experiences gained over the years while focusing exclusively on the needs of commercial building owners, their tenants, guests, and employees. From the simple needs of a small occupied single office to larger projects, complex and complicated in nature, we have capably served clients all over the South Jersey area, since the Late ’70s. Starting from assisting Chris’ father during high school, doing floor stripping and waxing, general floor maintenance and building maintenance, Chris continued to work and manage small accounts thru college, doing both full-time. Then after graduation, we grew our maintenance company to do all facets of building maintenance: regular daily cleaning, periodic carpet & floor care, all the way to complex maintenance programs for large clients, multi-tenant and multi-building clients. Everything they needed we did. From implemented carpet cleaning programs and stripping and waxing programs to anything they needed. And always, we combined traditional methods with newer technology. At the height of our service, the PSE&G staff admired our cleaning program at their flagship location in Moorestown (at 8 of their local locations) so much, they sent a team down from Corporate to study our maintenance plan. Their goal was to copy it and to roll it out company-wide. As folks may recall, the Recession of the 1980s was a tumultuous time for commercial real estate and businesses serving that industry. Vacant commercial property was abundant, companies were going bankrupt, and it became difficult to stay in business because there was so much volatility. It was a perfect time for us to re-brand and frankly simplify our lives. We evaluated our business plan, heavily invested in training, equipment, and technology and began working and serving residential clients with their various specialized, or “technical” cleaning needs. At the same time, we made ourselves available for the periodic and specialized needs of our commercial clients, although no longer on a daily, weekly or monthly basis. Shedding our accounts and staff, we migrated our best people and re-directed efforts for homeowners and families. With our experience and background and a burning desire to provide cleaning with exceptional customer service, there was no looking back! In commercial work, every job presents unique circumstances. The team hired must have an understanding of the ebbs and flows of the customer’s business and be able to adapt. They must be able to close off areas, clean quickly, and get them back online quickly. Often deadlines must be met. The team must be proficient in gaining access to a facility, good with working with keys and alarm codes and be able to keep lines of communication with contact folks on or off-site, as needed. Throw a little thinking on their toes and problem solving perhaps with limited resources, it is obvious that can make or break how a cleaning team gets the job done, is measured as being effective and successful. It is for this reason that a seasoned team, such as ourselves can jump right in even for periodic cleaning and execute the work effectively with little preparation. Experience goes a long way, and our experience will no doubt pay off in helping you and our customer achieve their goals. While our stripping and scrubbing are that with which any competent floor team can do, our new methods and technology out deliver. We incorporate technical steam rinsing using our truck mount cleaning machine. No single floor guy with a mop and bucket could ever replicate what the steam technology achieves. Hot water at or near boiling, moving thru a steam wand blasting at 1500 PSI Pressure and used to scrub and rinse the floor will always out clean human efforts. Additionally, even the vacuum power recovering the mop slurry is never equaled by human effort- the vacuum power is so intense it will blow an eardrum, collapse a lung or worse. This rinsing and steaming prep the floor for a wax-like nothing currently on the market. 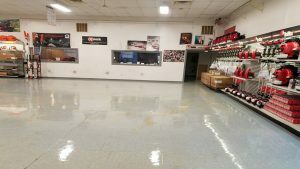 Now with the heavy lifting done, our choice in quality wax coatings will protect and dress the floor for days, weeks, months, even years in some instances. Should the project have a larger footprint, we have the capability of manning the job with a team of experienced professionals all with similar equipment setups. And frankly, we can capably cover thousands of square feet for any job we are requested to handle. Certainly, we are well equipped and experienced in doing commercial carpet care. But other challenges must first be identified, dealt with and juggled in a manner that gets the project done without affecting the normal operations of the business. As summarized earlier, some jobs require minimal down times, and some require evening or weekend service calls. The carpet cleaning must be organized and appropriate for the challenge at hand. Some areas must be dry if not immediately, almost instantaneously. We work with our clients advising them the best cleaning plan needed given their objective, their specific soiling issues, their timeline, and their budget. We listen, and we respond in the best way that serves our customer. Whenever possible commercial carpets, like residential responds superbly to steam cleaning. A key benefit is the complete removal of dry soils that embed in carpet, which if left grind and deteriorate the carpets pre-maturely. Ever see what appears to be “railroad tracks’ specifically across a carpeted room? Those tracks originally appear as soil, but soon digress to soil and damage. Effective vacuuming and steam extraction rinses and removes these soils extend carpet life. The Steam Cleaning equipment is more powerful than the portable alternative. But there are times other tasks also are included for successful cleaning. And since most janitorial crews aren’t invested in the technology they can’t deliver the same results. Not to mention they lack essential education and training. So the average janitorial crew will never be able to perform to the degree a seasoned carpet cleaning team will do. A hybrid technique for cleaning commercial carpet, this modified limited moisture method has its place when carpets need to be dried quickly. The encapsulant is a solution that attaches to soiling and continues to work after drying. Typically, there is a heavy rotary machine, again not usually in the janitorial crew’s tool shed. At last this categorized carpet cleaning method is recognized as a “type” of carpet cleaning by the Standardizing Authorities. The Bonnet Method is the most basic, least complicated method, and can usually be done with the equipment on hand in the janitorial supply closet. Add a little cleaning solution, and a floor guy who can run a buffer, there you have it. Or, let them have at it! But, buyer beware! At best the solution is applied, and a heavy cotton bonnet (a thick web of a cotton absorbent pad) is run on the carpet area after being sprayed with detergent. Here the only cleaning that occurs is what is rubbed off and absorbed on to the clean pad. Once the pad gets dirty, a new one replaces the dirty one, and the cleaning resumes. In reality, the cleaning person does get surface dirt off the carpet nor do they get the deeply embedded soils that cause damage to the carpet. A fair amount of soiling in the high traffic areas is simply redistributed to less traveled areas. Also absent, there is no germ killing, no rinsing of soils, oils, and contaminants, nor is there any rinsing of detergent residues left behind. With little true benefit, this is the most cost-effective alternative. Regretfully the results take second place. There is no need for special arrangements and planning because the regular crew can handle it. Regretfully the results take second. Other Hard Surface Care- Surprisingly One Call Does It All! There are a variety of different floor projects that our team can tackle if requested. The possibilities are numerous. Ceramic Tile is less complicated to maintain, and again can be done with traditional methods. However, with our methods, it will be done better and faster. 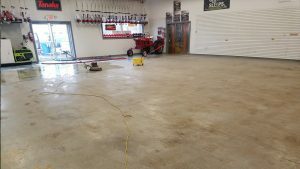 Not only is the floor work easier with better results, so is the vertical and nonfloor surface work. We have tools just for vertical surfaces, edges, and corners that make the cleaning easier and better. In an example, a public bathroom with multiple stalls, or a gym bathroom with showers, grooming and dressing areas are perfectly tended to by our Truck Mount Steam Process with these specialized tools. Stone Care, whether for residential or commercial purposes is a whole different field of expertise. It requires yet more investment in highly specialized tools, including weighted floor machines that grind the stone. Equipment must be appropriate for floors, steps, counters, walls, and vertical surfaces. Clearly more technical, timely and costly, it is rare to find a traditional flooring team able to do this work. Cement responds excellently to the steam extraction treatment. In an example, occasionally we are asked to steam floors for restaurants back in the kitchens, walk-ins and storage areas. Frankly, this can either impress you with the amazing results or freak you out when you see how dirty some areas are that are in the business of serving food. Cement or sealed cement can take years of abuse and become a red- hot mess. Take for instance Mechanical Bays at a dealership, or floors in a manufacturing facility. With our equipment on the job, it can reverse or clean up years of hard abuse. More ancillary surfaces, these installations are all part of a maintenance program that needs attention, and can benefit from our steaming and vacuum recovery process should we be called upon to do so. Some surfaces suffer from standing water damage, or experience green moss, or dirt, grease, and mud. They may respond well to the steam tools, but unlike what power washers do, we can recover the water in our waste tanks which are removed from the serviced area giving a rinsed clean appearance. Let us help make the first impression your best impression. Our team stands ready to advise and tailor a program specifically for your building’s needs, large or small. When you call we can answer your questions, get you a free estimate and schedule an appointment when you are ready to proceed.